When I first saw the title of the book, I admit I thought it would be an interesting read but maybe not hit where I'm at right now. 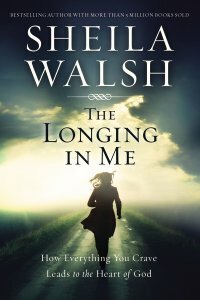 Knowing it was written by Sheila Walsh made me want to pick it up. I was given a digital copy from the publisher, but not required to write a review. The book opened my eyes so much that I bought a physical copy at my own expense. It touched places of hurt that I didn't know were there. It gently made me want to let go of areas I knew I needed to in order for God to bring something so much better. Whether you have faith, aspire to faith, or are strong in your faith, this book cuts across all denominational and cultural lines and brings a personal story (Sheila Walsh's) paralleled with the accounts of David in the Old Testament Bible. So, that's the honest truth in a nutshell! Now, if you want to dig in deeper and find more than that, you can. I did. Sheila does a superlative job with words, crafting them to find common ground with any reader. This book that is currently in my collection will be one I read over and over again, not because it's too hard or heady but because there is so much GOOD STUFF in it that addresses the human condition, the needs we have, and the longings we have that often get filled in ways that are unhealthy or dangerous.